Champion marathoner Alberto Salazar remained hospitalized Sunday after collapsing the day before at the Nike company campus. Doctors were conducting additional tests to learn the cause of the 48-year-old runner's "heart event," said Lisa Helderop, a spokeswoman at Providence St. Vincent Medical Center. "Basically nothing has changed." Salazar collapsed Saturday while coaching distance runners at the campus outside Portland, Nike spokesman Bob Applegate said. He was awake and alert when he arrived at the hospital, and a stent was inserted to open an artery. His family remained by his side Sunday in the hospital's cardiac care unit, Helderop said. 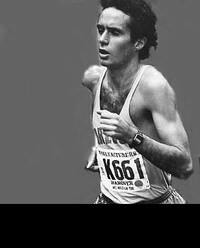 Salazar, a University of Oregon graduate, won the New York City Marathon three straight years (1980-82) and the 1982 Boston Marathon. He has set six U.S. records and one world record. He is a longtime Nike employee and consultant who trains elite distance runners and has a building named for him on campus. "We wish him a recovery as fast as his record-breaking marathon times," Nike chief executive Mark Parker said in a statement to Nike employees. "He represents the best of what Nike has stood for since the early days of the company." Sunday after collapsing the day before at the Nike company campus.